Unknown to most residents of the United States, the South American tuber Oca (Oxalis tuberosa) is popular second only to the potato as the number one root crop in Bolivia and Peru. I can hear you now, “What’s oca?” This nutritious, versatile root has been extensively studied in New Zealand, one of the few places that oca plants are found growing commercially, hence, its other name, New Zealand yam. Want to learn more? Read on to find out how to grow New Zealand yams and additional New Zealand yam info. Oca is beginning to show up in Latin American markets in the U.S. It is a fruitful perennial that produces brightly colored, rough, waxy tubers that are best harvested in early winter. It is used as a season extending crop in many areas. Growing oca plants requires a long growing season. Contrary to its other common name of New Zealand yam, oca is neither related to potato or the sweet potato. It is instead related to European wood sorrel, which is used as a leafy green. New Zealand farmers became intrigued by oca 20 years or more ago. They recognized that the plant was cultivated in areas of South America with similar climate, latitude, altitude and day length observed in New Zealand. They also recognized its hardiness and nutritional components. Oca is not only a carbohydrate but contains phosphorus, iron and essential amino acids. Over hundreds of years of cultivation in South America, many different varieties of oca have come into being, and farmers in New Zealand have dabbled with the tuber as well. Because of this, it is hard to describe the flavor of oca. Some varieties are so sweet they are sold as fruit and are fried or candied like sweet potatoes. Other types of oca have bitterness due to the plants composition of oxalic acid. Oxalic acid in quantity can harm the urinary tract but in the case of oca, one would have to exclusively eat the tuber to achieve any ill effects. 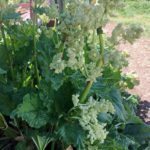 That said, if a person has gout or kidney stones or has ever had a reaction to rhubarb, sorrel, beet greens or spinach (all contain oxalic acid), they should avoid ingesting oca. Oca is a versatile tuber that can be boiled, baked or steamed. Some varieties are delicious eaten raw, while others are sun dried and eaten like dried figs or stewed like fruit. The clover-like leaves of oca and its trumpet shaped yellow blooms are edible as well and delicious tossed into salads. Oca is hardy in USDA zones 9b to 11. It is highly light sensitive and will not form tubers unless it gets at least 12 hours of light per day. This means that they won’t form until late fall, so they need to be kept well covered until early winter or grown in plastic tunneling with a heat source. In open ground, however, plants form more tubers than when grown in tunneling. Oca, like potatoes, are propagated from tubers. They prefer sandy soil, partial shade and cool, damp weather. Plant whole tubers in pots in late winter and then when they begin to vine, transplant them to tubs or directly into the garden after all possible chance of frost has passed. Oca doesn’t tolerate hot sun or hard drought so the plants must be kept consistently watered. Feed the plants heavily in early autumn. The plants have no known pests in North America. At harvest, the plant will have many different sizes of tubers. Save the smallest tubers for seed stock in a cool, dark area until planting time. For those that are to be consumed, also store in a cool, dry area out of sunlight. There is no need to keep oca in a root cellar or refrigerator and they can be stored for months as above. Read more articles about Oca.